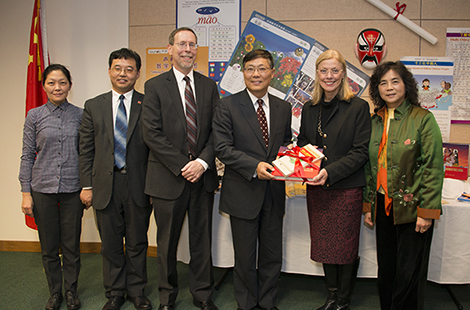 Campus leaders and a packed audience welcomed Ambassador Jian Liu and members of the education consul to CSUN, recognizing China’s donation of more than 2,000 books. Read more about the visit. The National Endowment for the Arts awarded Martin Pousson, associate professor of English, its 2014 Creative Writing Fellowship in Prose. The grant supports Pousson’s latest work. Read more about the recognition. CSUN President Dianne F. Harrison has assumed the chairmanship of the Western Interstate Commission for Higher Education. Read more about the commission. Sat., Jan. 18, 7:30 p.m. Sat., Jan. 18, 8 p.m.
“Jim Henson’s Sid the Science Kid: LIVE!” is making its first Southern California appearance on Saturday, March 8 at CSUN. Four CSUN employees were honored for being life-changing mentors at the Educational Opportunity Program’s Don Dorsey Excellence in Mentoring Awards.